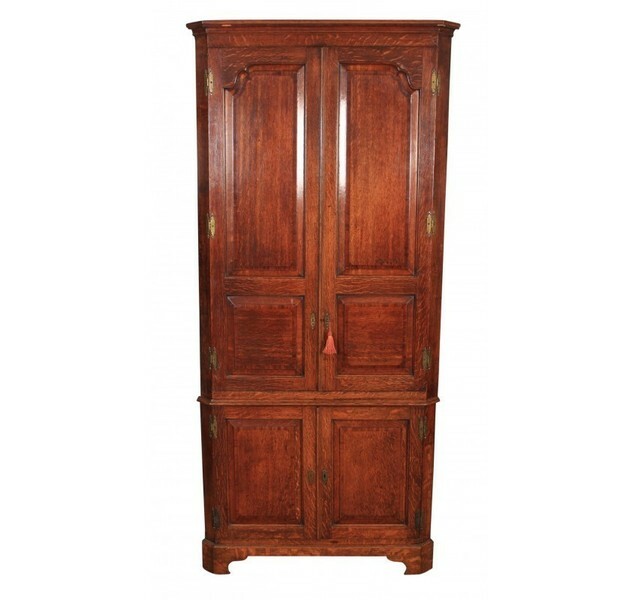 This Georgian oak corner cupboard is in good original condition, we don't normally stock corner cupboards as a general rule but this one is a particularly good example. Good quality solid oak construction, with fielded cross-banded panels and decorative brass hinges. This item comes in 2 parts for easy transportation, the top section opens to reveal a cream painted interior with fluted supports, an arched top and 4 fixed shelves. There is a further shelf in the base cupboard. Other: Cupboard Base H 74.5 cm/29.25"
Driver will normally require help unloading the item. This item will be shipped from detling, United Kingdom of Great Britain and Northern Ireland.